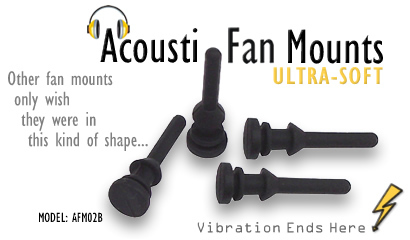 AFM02B - Acousti Ultra-Soft Fan Mounts are available in both Retail Packs of 8 mounts (shown), and packs of 100 mounts in bulk (enough for 25 fans) for OEM and system builders. AFM02B Fan Mount Design. 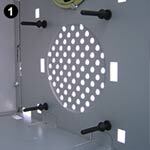 The fan mount has been designed with smoothed corners to prevent the propagation of cracks when stretched. When in position, the fan is held 1.25mm away from the case side - this is just enough to allow free movement of the fan and effectively absorb vibrations, but not too much to cause excessive air pressure loss around the fan. 1. Fit fan mounts to the case FIRST! Thread the fan mounts from the outside of the case through the case fan mounting holes, and pull the end of the mount (the arrowhead part) though until the mount 'pops' into position. 2. Thread the fan onto the fan mounts. Align the mounting holes on the fan corners with the fan mounts, and gently place the fan onto the mounts, so that they poke through each hole. 3. Pull fan mounts through fan holes. 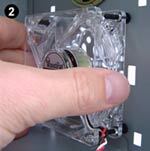 Using your forefinger and thumb, carefully pull the 'arrowhead' part of the fan mounts through the fan mounting holes. The trick here is to pull through and sideways at the same time, easing the arrowhead through. The arrowhead should pull though with a small 'pop'. Exactly what I've been looking for. Nice & sturdy yet flexible, easy installation. First time buying from QuietPC.com as well: order received within 5 days (Belgium), properly packed to boot. Very pleased! 5/5 for both the product & service. These really do the job of reducing vibration from fan to case very well indeed. I ordered them to use with a couple of Noctua fans. Although Noctua fans already come with their own silicon fan mounts which are good, I found that they were very difficult to actually install in tight corners of the case due to their slightly harder stiffness. These are a must have item. Love these to bits, nothing technical, simple to use and really make a difference. Will be ordering more to put in my spares box. Really easy to fit and did the job on my ReadyNAS Duo.